February 8, 2019 Warframe’s big melee rework is finally close to launch. At least in part. 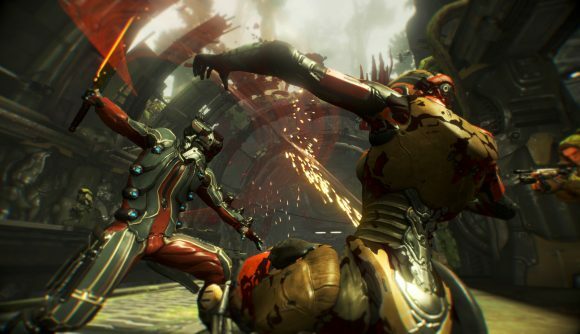 Warframe’s big melee update has been a long time coming, and we’re finally about to get the first bit of it. Melee 3.0, as Digital Extremes has recently noted, is coming at us in waves, and the first wave is currently targeted for launch next week. The developers refer to this – at least a little jokingly – as melee 2.5, and it will bring instant switching and aimed slams to the game. Besides offering more details on Hildryn and Wisp, today’s dev stream also detailed what’s coming in the melee update. A quick tap of the melee button will pull out your melee weapon and immediately strike with it. After that attack, the weapon will remain equipped. Similarly, hitting your standard weapon fire button will pull out the gun and squeeze off a few rounds. Your gun remains equipped until you swap again. That’s been one of the core melee 3.0 changes discussed from the start, and it’ll be part of this first update. That fast switch will also apply to in midair, so you can instantly bring out an aimed slam against your enemies. That’ll save you from any delay in making the attack happen. You can check out the new melee in action via the dev stream below, starting at around 54:30. This is currently planned for launch next week on PC, though that date isn’t guaranteed just yet – but either way, it shouldn’t be long before the melee rework finally starts to land in-game. For now, mods are unaffected, as are combos and animations. It’ll be a while longer before we see all of what melee 3.0 entails, but 2.5 should be a good starting point toward more fluid combat.